a The Prophet Hud (pbuh) - To The People of 'Ad - . Hud was the Prophet sent to the Bani 'Ad for their redress. His pedigree genealogy joins with the Prophet Nuh (peace be upon him) and his sons. Nuh had 3 sons who were survived from the flood-- Sam, Ham, and Yafith. The children of Sam were dispersed in the Arabian Peninsula. Sam had a son called Iram. And one of Iram's sons was 'Ad. So they named the town after his son--the city was named 'Ad. The town of 'Ad was very dusty and situated near Ahqaf, near Hadramout in Yemen. Who were these people of 'Ad? They were the people that God sent to them the Prophet Hud. They lived near Hadramout, which is now in Yemen. There they built mansions , established temples and worshipped deities and stars. The names of their major deities were Saqi'ah, Salimah, Raziqah and Hafizun. This worshipping of busts came after a time when the people of 'Ad once believed in the one God. The people of 'Ad were tall in stature and were skillful masons. God had presented them multitude of wealth, cattle, children and gardens. They had gained a great degree of civilization. Among them flourished the notorious king Shaddad. He built a magnificent mansion near 'Aden. It was known as the Garden of Iram. He was a mighty king and his conquests stretched to Syria, Iraq and the confines of Sub- continent of Indo-Pakistan. These people were proud of their accomplishments and considered themselves to be immune. They were indulged in guilts and committed deeds of oppression and violence. Instead of expressing a deep sense of gratitude to the Almighty God for the favors He had awarded upon them, they became trespassers and showed disobedience to Him. God sent to these people and to the city of 'Ad a man named Hud. Since he was a man from amongst them, it was sure that they would be more inclined to listen to him. The people of 'Ad used to call Hud a crazy man. There was one man in particular, called Abu Thamud, who used to call the people to listen to Hud speak. He wanted to prove to the people that Hud had indeed become crazy. The people asked Abu Thamud, "We know that Hud does not come to our gatherings nor does he believe in our gods. What has happened to him that he does not mingle with us?" 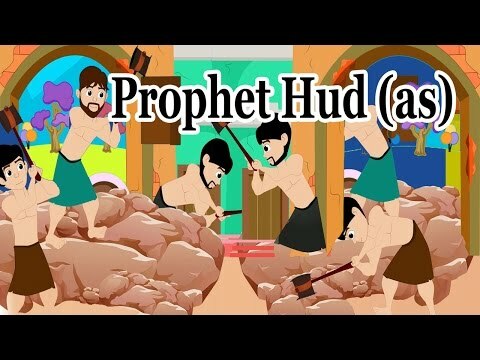 Abu Thamud answered (mocking) that Hud states that God sent him as a prophet and as a Warner to the people of 'Ad. And unless they stop believing in statues, that a terrible punishment from God would happen . The people of the city then determined to go to Hud and hear what he wanted from them. Hud answered that he did not want anything from them except that they believe in the One God. The people of the city rejected to believe and started to say that Hud had indeed gone crazy. Since they were so strong in body size, they used to believe that no one was more strong than they. They insisted that they will not leave their gods. They also pretended that since Hud did not come with any marks , that he must be lying. Still another person said that if Hud wants them to leave their gods, then he must come with the punishment that he is talking about. However, Abu Thamud started to slowly listen to what Hud was talking about. He started to believe in what Hud was saying about the one God and about how man would be resurrected after death. When the people of the city started to hear what Abu Thamud was saying, they pretended that Hud must have put a spell on him. Abu Thamud insisted that Hud had put no spell on him but that he now believed that which Hud was saying. Abu Thamud further pretended that it is ridiculous to believe that statues that were made by man could have made the earth and all that it contained, along with the sky, stars, moon, and sun. He said that there definitely had to be a higher being--One God. Abu Thamud was now very glad and told the people that he was now going to look for Hud. Before he left, he reminded the people that they should take a close look at the way they were living and believing in statues. He declared that the statues have no power and were of no use. He further declared that they should look at their lives and how extravagant they were with gambling, intoxicants, and luxuries. Abu Thamud then proceeded to find Hud so that Hud could tell him more about God, the One, who created man with boons and who will make man die and resurrect again. He then went to Hud and announced his faith in the one God. Abu Thamud was then called Abdullah (the servant of God). He would become angry if anyone would call him by his former name. The people of 'Ad still would come to Abdullah and try to convince him that Hud had placed a spell on him. Each time Abdullah would announce his faith in the One God. Finally the people gave up on Abdullah. They granted him a message to grant to Hud. They wanted to relate to Hud that they would persist to believe in their gods. And that they would never believe in what Hud was preaching. They also wanted Hud to come with the punishment he was talking about if what he said was true. Then the people of 'Ad went back to their homes laughing and mocking. The people of 'Ad used to boast that there was none more powerful than they. God definitely proved them wrong for their disobedience. God devastated not only the people of 'Ad, but the entire city as well. Hud and his faithful followers who had left to another place, were the only ones who survived this horrible punishment from God. Afterwards the remnant who survived founded themselves in Yemen. The grave of the Prophet Hud (AS) is in Hadramaut. It is visited by the Muslims in the month of Rajab.